A statue of Halifax founder Edward Cornwallis was vandalized after Saturday’s peaceful protest. 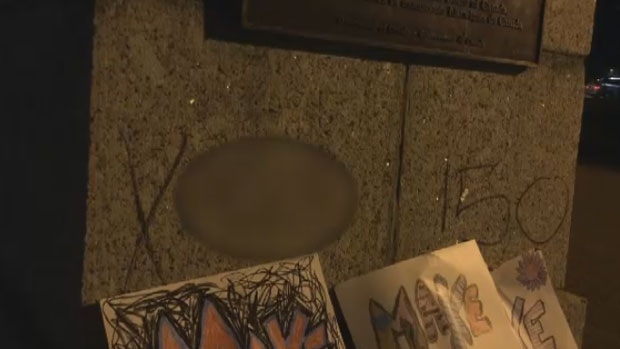 The base of the statue was defaced with graffiti condemning Canada 150 celebrations. The damage was later covered up with maps of Halifax until a cleaning crew arrived later to remove the message. This comes after a group of activists rallied together on social media to remove the statue, claiming Cornwallis represents the genocide of Indigenous peoples. Instead of removing the statue, both the municipality and protesters found a compromise during the demonstration. The statue was shrouded with a black tarp to symbolically remove the image of Cornwallis. City council will meet later this week to address calls to tear the bronze statue down and form a panel to look at peace and reconciliation. Protesters have given the city council until Oct. 1, which is Mi’kmaq History Month, to take action. The statue of Halifax founder Edward Cornwallis was defaced with graffiti condemning Canada 150 celebrations.